Precious metals were mixed Thursday. 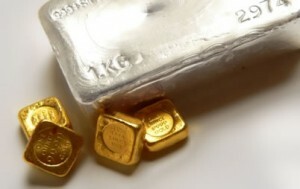 Gold and silver futures changed modestly, with the former rising 0.2% and the latter falling 0.1%. Gold for December delivery added $2.70 to settle at $1,367.40 an ounce on the Comex division of the New York Mercantile Exchange. Gains came as the Bank of England cut its main interest rate to the lowest level in its 322-year history. "The revision in expectations for monetary policy in the U.S., Japan, the euro zone and the UK has played a big role in the rise in the gold price so far this year, and we expect it to continue," Reuters quoted Capital Economics analyst Simona Gambarini. Gold futures traded from a low of $1,355.10 to a high of $1,371.40. In the prior session, they dipped 0.6%. On Tuesday, they settled at their highest point since Mar. 17, 2014. The yellow metal is 29% higher so far this year. Silver for September delivery dipped 2.8 cents to settle at $20.443 an ounce. Silver futures ranged from $20.08 to $20.55. They declined by 1.1% on Wednesday. October platinum shed $4.60, or 0.4%, to $1,165 an ounce, trading between $1,156 and $1,170. Palladium for September delivery fell $7.85, or 1.1%, to $706 an ounce, ranging from $698.85 to $714.95. Gold added $3.85, or 0.3%, to $1,362.75 an ounce. Silver declined 43 cents, or 2.1, to $20.16 an ounce. United States Mint bullion coins logged their first gains of the week and month. Advances include 5,500 ounces in American Gold Eagles and 75,000 ounces in American Silver Eagles. Below is a sales breakdown of U.S. Mint bullion products with columns listing the number of bullion coins sold during varying periods of time. Products with an asterisk (*) are no longer available. Not a single 5-oz silver bullion HF coin has sold since the second week in June! The Mint has offered them to their 13 worldwide bullion coin Authorized Purchasers every week & recently reminded them that they are available. Interest has really dropped as silver hit $20. It will be very interesting to see what precious metal prices do tomorrow with the July jobs report. Great July jobs report today (& low 4.9 percent unemployment rate) equals much lower precious metals prices today & maybe for next weeks largest coin show & convention in the world – the ANA coin show August 9-13 in Anaheim, California. Happy coin hunting!